It’s the 2017-18 winter and the school I’m teaching at develops a partnership with the Buffalo Maritime Center and a select batch of students are drafted to build canoes. The project needs a teacher to moderate and go to building sessions and I figured being paid to help kids build boats is way more exciting than tutoring. 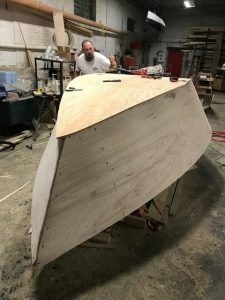 After being there for a few weeks I decided I would become a paid member of the center and build a drift boat. I looked into material costs and post construction parts like anchors and oars and figure I could get it done for less than 2000.00 dollars; and that’s way cheaper than buying one. And I gotta be honest, I’ll go winter steelhead fishing, but only when I’m desperate and grouse season is closed. I have also tied more flies than I could ever fish this summer and I haven’t stopped putting together new patterns. This entry was posted in Boat Building, Fly Fishing Life and tagged boat buidling, fly fishing, fly fishing life on May 10, 2018 by Brandon Sausner.